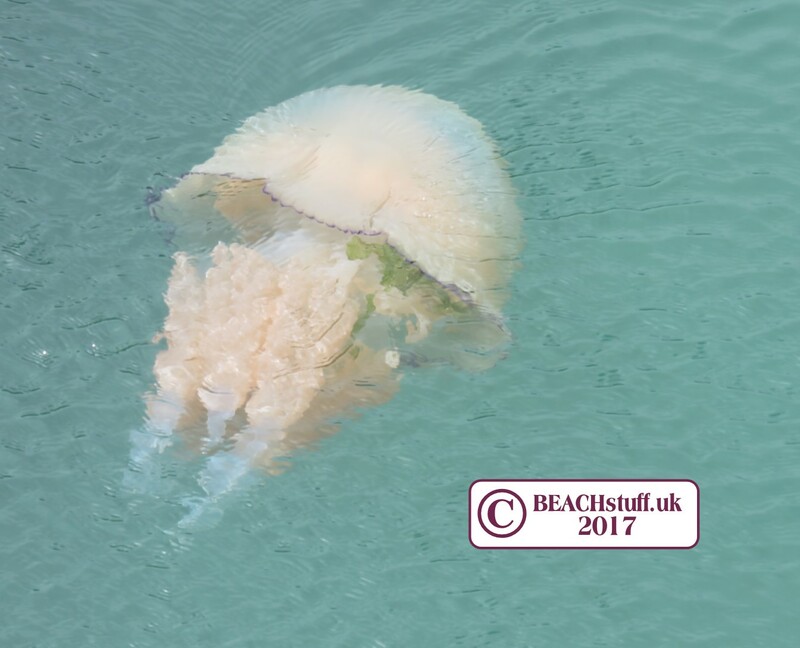 Jellyfish (not really fish at all...) are very poor swimmers and rely on the currents and tides to take them on their journey around the oceans. This means that we get some very exotic jellies around out coast. They are some of the most weird and wonderful creatures we are ever likely to see, even when stranded. Why do jellyfish strand in large numbers? 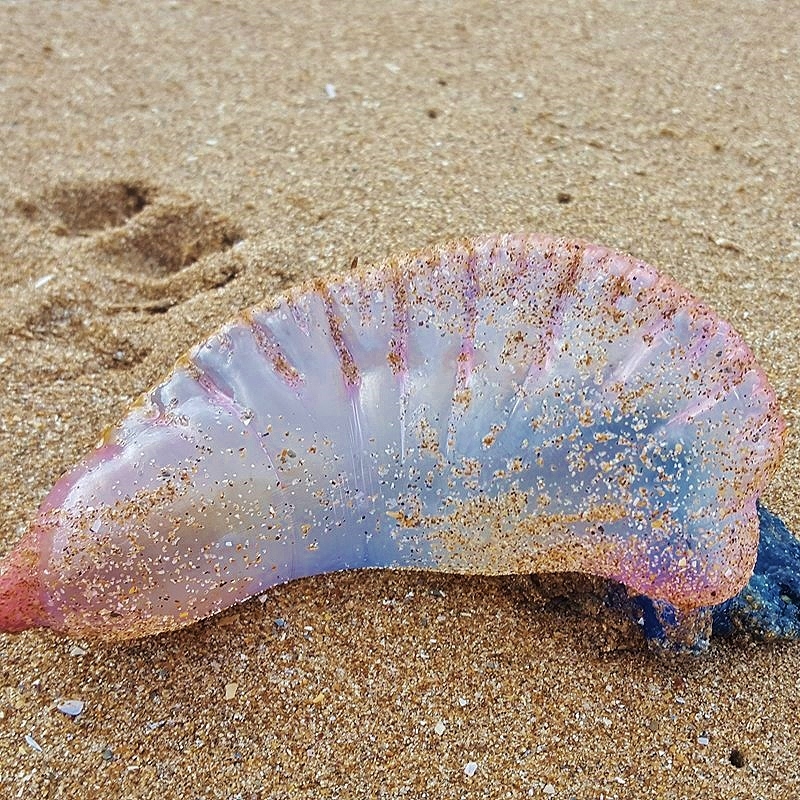 What happens when jellyfish get beached? 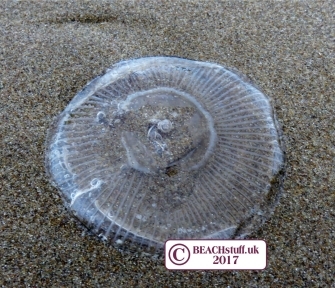 The Marine Conservation Society record which jellyfish get washed up and where so please report whatever you see. It is a very quick process and this link takes you straight to the reporting form. 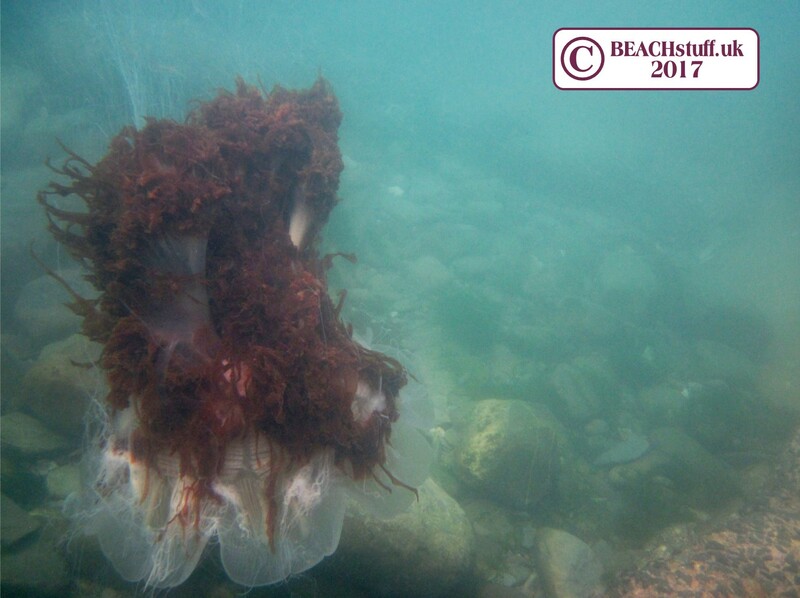 The more data they can get from people like you and me, the better our understanding of jellyfish will be. 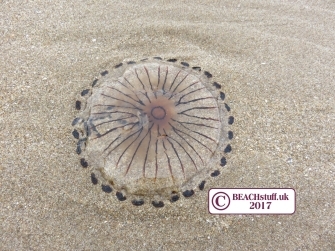 These are quite common in UK waters and distinguishable by brown lines radiating from their centre which gave them their name. A word of warning though, if you ever do find yourself lost at sea, don't rely on Compass Jellyfish to direct you home - they have no better idea where you are going than you do. 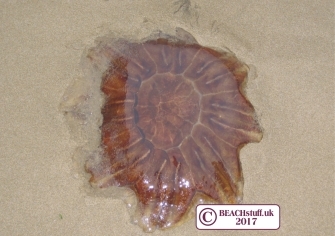 These are also called Dustbin Lid Jellyfish as they are often about that size in UK waters. They are solid-looking jellies, even when beached but, despite their impressive size and mass, their sting is thought to be generally harmless to humans. 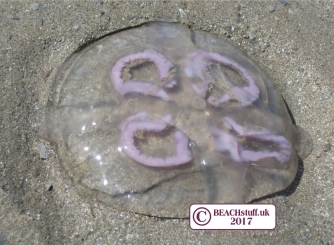 Below is one pictured swimming showing its wide, frilly tentacles. The video clip below shows the moment a barrel is beached unable to save itself. These are the largest known jellyfish (the biggest ever found was 2.3 metres wide and 37m long) although I have never seen one beached that was bigger than about 50-70cm across (big enough!). 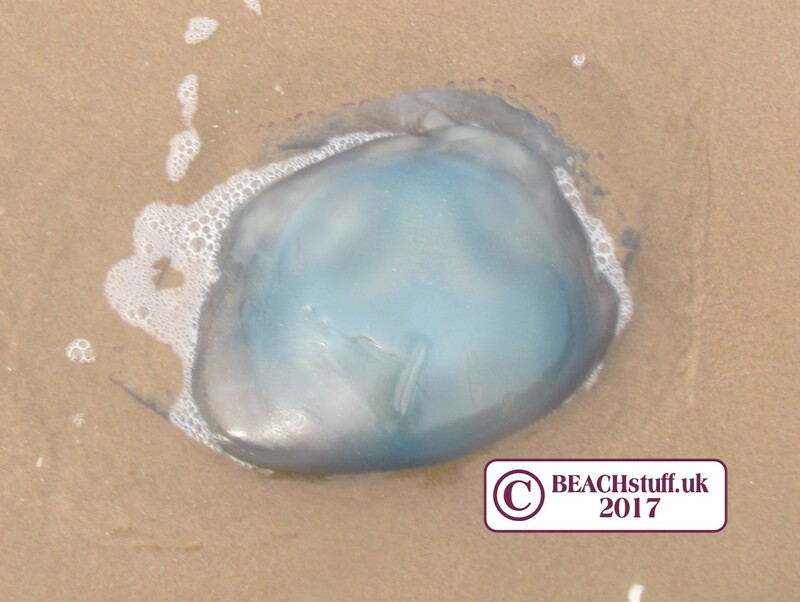 They have a gloopy quality when beached and can give you a painful sting, dead or alive. 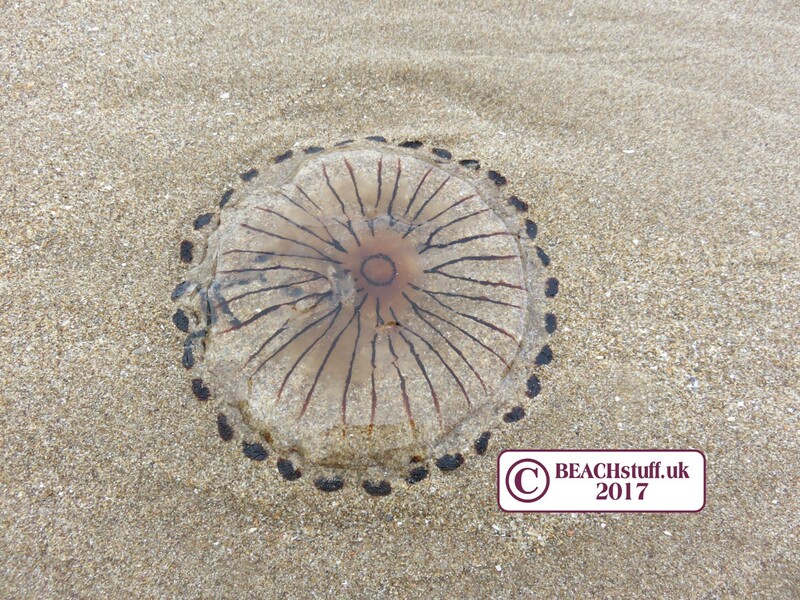 These are the most common of the jellyfish we see around the UK and are identifiable by their four pink rings, their reprductive organs. 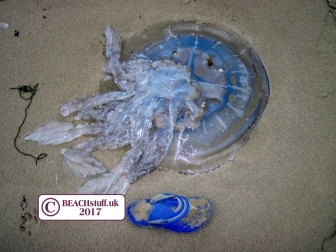 They are sometimes stranded in huge numbers on UK beaches particularly in the summer. These are distinguishable by the fact that you can hardly see any distinguishing characteristics at all! They are transparent and colourless. The one pictured has lines radiating out but these are not always visible. 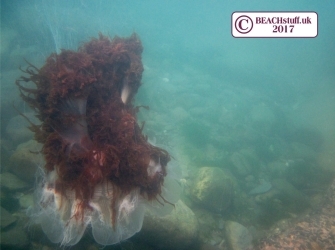 It is a favourite food of the Lion's Mane jellyfish. 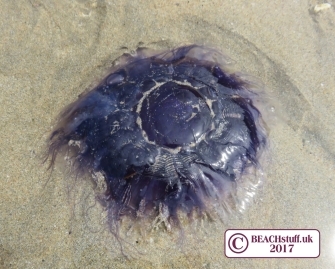 The jellyfish is often more purple than blue. 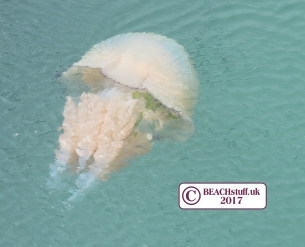 It is related closelty to the Lion's Mane jellyfish but is smaller - usually we find them only up to about 10cm across. Below is the blue jellyfish swimming. 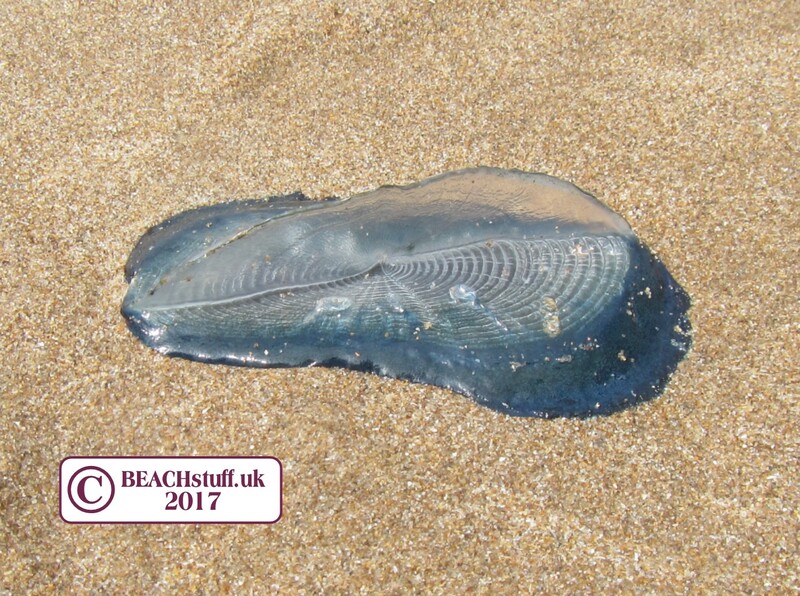 These used to be only occasional visitors to the UK but now seem to be getting more common, possibly because of rising sea temperatures. 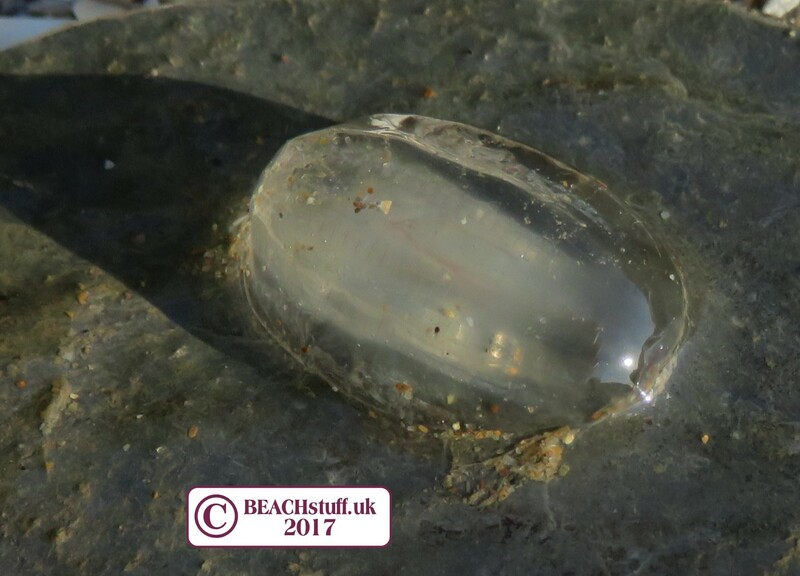 Ad their name suggests, they can give you a sting..
Only a centimetre or two long, this looks for all the world like a blob of clear jelly. 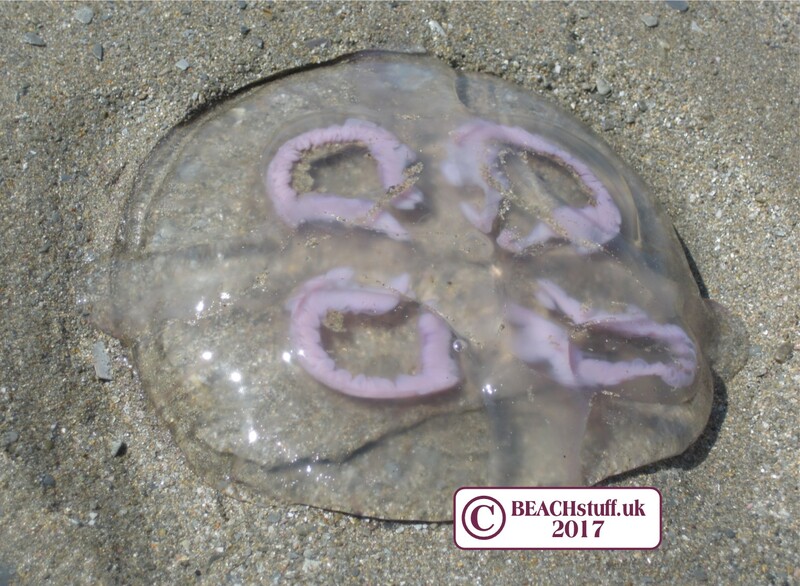 They are not in any way related to jellyfish - despite their appearance. 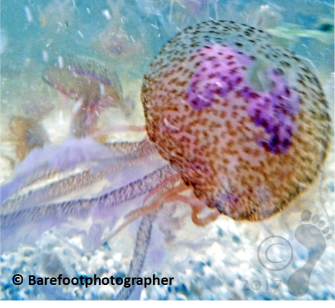 They have long tentacles with which they grab fish eggs, sea snails and pretty much anything else they can grab. 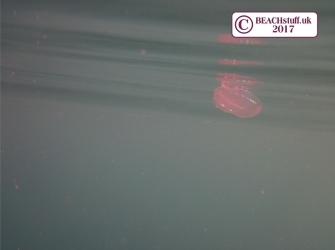 A rubbish photo I know, but below does a little way to show how comb jellies, like this, light up when they are in the water. 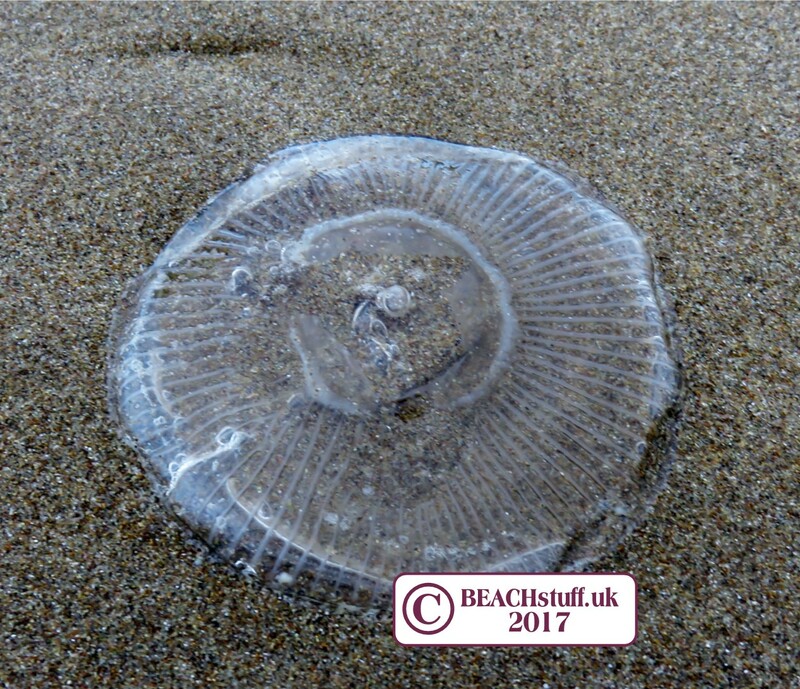 Like the Portuguese Man O'War, this is not really a single creature but a colony of creatures (hydroids) which work as one. It has blue tentacles (for catching plankton) and a clear sail with which to catch the wind as it floats on the surface of the sea. 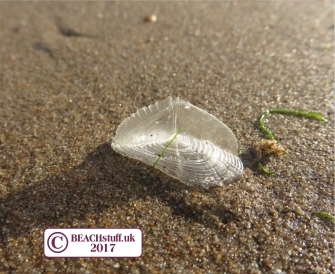 After being beached for some time, they turn completely transparent (below) and I have seen many people, perfectly reasonably, mistake them for sweet wrappers. 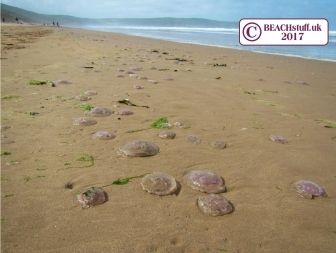 They seem to beach easily, sometimes in large numbers, when a strong wind or tide, carries them in the wrong direction. Their sail means that they are good at catching the wind but they are not able to change direction or swim for themselves and so are helpless if they get taken towards the shore. 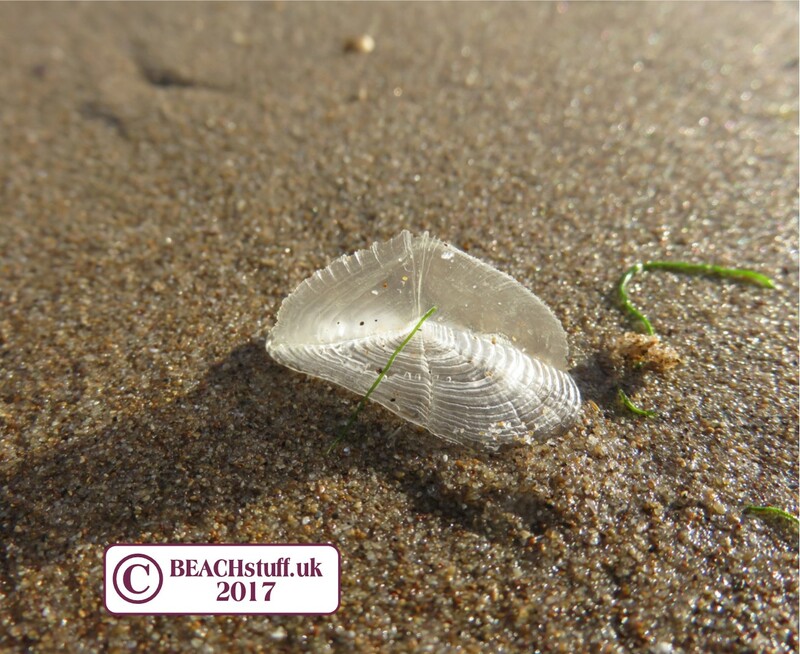 They will die out of the water but sometimes can be found still alive on the strandline. 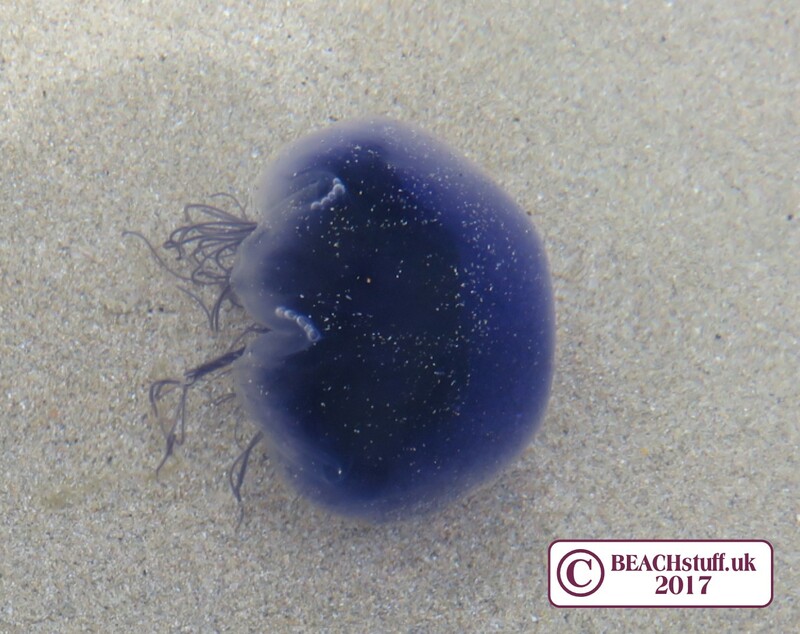 Pop them in a bucket of salt water and you may be able to see their tentacles (on its base) begin moving. 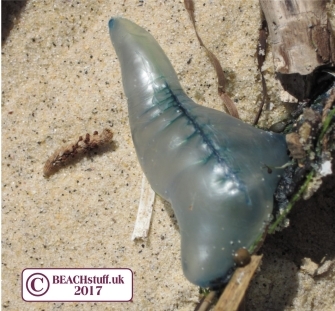 These don't wash up very often on UK beaches but are best avoided when they do as they have a very nasty sting (and can still sting even when they have been beached for a while). They float on the surface of the Atlantic Ocean, blown by the wind and carried by the currents. They feed on fish and other maine animals. They were given the name Man O'War after an 18th century ship. In Autumn 2017, huge numbers washed up in the UK. We did a massive project to getthese mapped - have a look at the results here.